Interactive installation in Fonteinkerk (Fountain church) Haarlem, during manifestation "Feest van de Geest" (Celebration of the Spirit) 2016. 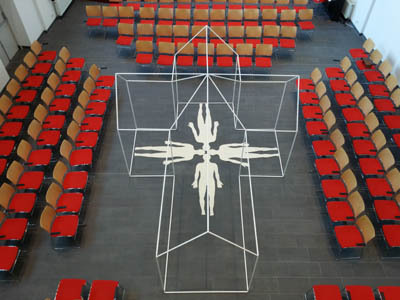 In this picture: iron frame sculpture of a church placed inside the Fountain church, felt figures for meditation and feeling the connection between heaven and earth: the blue church ceiling and the stone floor. On the wall I put a quote from a poem by Koos Geerds: "Onder dit dak ben ik een mens die adem krijgt", which means: "Underneath this roof I am a man that can breathe. Inspiration literally means: breathing through somebody. In the entrances to the church hall I installed other works that invited the visitor to touch it or move through it (see other pictures).